Thank you for your interest in purchasing humanely-raised, heritage breed pasture pork from Elkhorn Farm & Forge. Here at Elkhorn, we raise happy, stress-free hogs outdoors, where they are free to roam, root, and run around all they want, any time they want. We raise two heritage breeds known as Gloucestershire Old Spots (GOS) and Large Blacks as well as crosses between the two. These breeds are known for having more lard and superior tasting meat. Part of that great taste is also due to the pasture aspect of our farm. Hogs love to forage around in the soil for tasty treats and the diversity in their diet adds nutrition and flavor. When you buy a whole, half, or primal, you pay Elkhorn for the hog and then you pay the butcher to slaughter/cut/wrap/cure the meat to your specifications (or else you do the cut/wrap/cure yourself). When you buy a box of mixed cuts, Elkhorn has already raised and slaughtered the hog and paid to have the meat cut, wrapped, and cured. When Elkhorn sells a box of meat, all of the decisions have already been made and you receive a box of meat that’s ready to eat. We tell the butcher what cuts of meat to create, we pay the butcher, and then we mix and match the various cuts into various size boxes. The advantage of buying a share of pork (as opposed to a box) is that you get to pick and choose the cuts of meat you want. For example, if you like ham, you can have the butcher cure up as much ham as possible. If you don’t like ham, you can have that portion of the pig turned into roasts, ground pork, or sausage. Another difference is the overall quantity of meat you’re buying at one time. A half-share of pork is about 70 lbs of cut/wrapped meat. That’s typically more meat than can be placed in a normal refrigerator freezer, so you need a separate stand-alone freezer if you buy a whole or half-share. Think of a 20 lb box of meat as about the same size as a grocery bag; it’s designed to fit in your standard refrigerator freezer. When the hogs reach the desired weight, Elkhorn pays a state-licensed professional to slaughter the hogs, and then transport the pork to a butcher. The butcher cuts, wraps, and cures the meat to your specifications. You pay Elkhorn directly for the hog; you pay the butcher directly for the slaughter, cut/wrap and curing. If you prefer to cut/wrap/cure the pork yourself, Elkhorn will deliver the chilled carcass directly to you. Once your pork arrives at the butcher shop, Elkhorn will help you get the cut/wrap/cure instructions completed and submitted so the butcher has your specific instructions. The cutting and wrapping process typically takes about a week from start to finish (depending on the butcher’s schedule) for the “fresh cuts” such as pork chops and roasts. Cured and smoked meats like bacon and ham usually require an additional two weeks to complete. Once your hog arrives at the butcher, they will weigh it and notify Elkhorn of the “hanging weight” (which consists of the whole hog minus the entrails (and maybe the head, feet, and hide depending on whether you want those items or not). Our goal is raise the hog to a size such that it ends up close to 225lbs hanging weight (112.5lbs for a ½ share). Once the hog has been cut and wrapped, you can expect to receive about 70% of the hanging weight (~78 lbs for a ½ share) of fine eating pork. * Exact prices and fees vary by butcher. This is a typical example based on prices at Mt Angel Meat. So, in the example above, your total cost is $450+$40+$72+$7.65+$5.10+$17+$3 = $594.75 (assuming 112.5 lbs hanging weight and you want all the optional cured products). Obviously, a hanging weight that is higher or lower will result in higher or lower butchery fees. Both butchers guarantee that you will receive your hog and only your hog back (many other butchers will process the meat from multiple hogs at once and randomly assign equivalent poundage back to you, but they won’t guarantee that the meat you receive came from your hog). 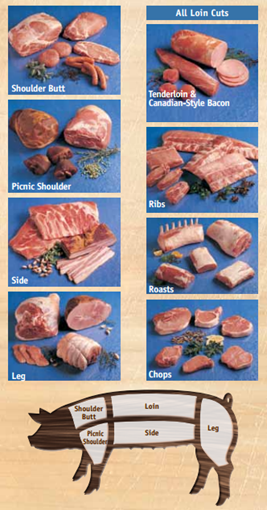 We want to know our food field-to-table, so we have selected these butchers for both for quality and taste. We also want to know (not hope, guess, or assume) that our hogs are treated humanely during the entire kill process, so they are calm right to the end and their lives end in an unexpected, fear-free, pain-free instant. We work with the Meating Place for mobile slaughter and Mt. Angel Meat for USDA-inspected slaughter. They both understand our requirements for stress-free, humane treat and both provide this level of care and commitment. They both have operations that are 100% transparent and open to our observation. When you place your order with us, we will discuss your goals and help you select the slaughter and butchery options that will work best for you. For the option where you are buying a box of meat that’s already cut/wrapped and cured, we’ve already selected the butcher and cuts of meat. All you have to do is provide payment. When you’re ready to buy, please visit our online store, give us a call/text: 503.780.2596 or send an email to Matt@ElkhornFF.com. Some months sell out in advance so it’s best to contact us before you’ve eaten your last pork chop from the freezer. Q: What sort of cuts do I end up with when I get my pork back from the butcher? Can I have it all turned into bacon? A: The answer is Yes, No, and Sort Of. Bacon as we know it in the United States is cured pork belly (part of the “side” in the diagram) However, in addition to the strips of pork belly bacon that we’re all familiar with, “country bacon” can be made from the shoulder and is also very good eating. People in the United Kingdom have the pork loin cured into “rasher bacon” (note rasher bacon will come at the expense of pork chops, as they are both cut from the loin muscle). Finally, jowl bacon is also an option. Note that pork sausage is missing from the diagram and that’s because sausage is typically made from small pieces of leftover meat that result from creating the main cuts. Having said that, you could have the entire pig ground into unseasoned ground pork or seasoned ground pork sausage if that’s what you wanted. Q: If I’m paying cut/wrap fees on 112.5 lbs of hanging weight, why will I only get about 78 lbs of cut/wrapped meat from the butcher? A: During the cut/wrap process, the butcher will trim away skin, fat, and bone, which reduces the overall weight of the finished cuts by about 30%. While it may seem at first glance that you should only pay the cut/wrap fee on the 78 lbs of meat that you receive, the point to remember is that the butcher has to cut up the entire 100 lbs of pork. Deboning and trimming the meat takes time and effort. The larger the hog, the more effort the butcher has to put into it. The butcher’s work is dictated by the hanging weight, hence you pay cut/wrap fees on the hanging weight (112.5 lbs) instead of the cut/wrap weight (~78 lbs). Q: Does “pasture pork” mean the hogs only eat pasture grass? A: No, our hogs live outside in the woods and on pasture, where they are free to root up nuts, grubs, and other tasty morsels. We also make grain available to them and the hogs choose what they want to eat at any given time. Hogs like a variety in their diet and that variety also adds terrific flavor to the pork. Q: Does Elkhorn sell pork that’s already cut, wrapped, and cured? A: Yes, please visit our Online Store to see what’s currently available. Q: Is “dry curing” an option for the hams and bacon? A: Yes, No, and Sort Of. Dry curing meat (charcuterie) is the process of using salt to preserve the meat in a temperature and humidity-controlled environment. It’s a traditional “old world” method of meat preservation and the final product tastes fantastic when it’s prepared correctly. The downside is that it can take months to cure the meat and for that reason, most commercial butchers won’t do it for you. They offer a “wet cure” option that takes 1 – 3 weeks as opposed to 3 – 18 months for a dry cure. However, if you want dry cured ham or bacon, one option is to tell the butcher to give you those cuts uncured and then you can either cure them yourself or take them to a charcuterie specialist, such as Proletariat Butchery (http://proletariatbutchery.com/) in Portland. Q: Will I receive the head, hide, fat, and “sweet meats” (heart, kidneys, etc.) from the butcher? A: Yes, if you request them prior to slaughter. Most people don’t want these parts of the hog, so the butcher expects to dispose of these items for you by default. If you would like to receive any or all of these, please let Elkhorn know before the hog is slaughtered so we can be sure the mobile slaughter unit keeps them for you. Q: How much freezer space is required for ½ hog? A: In general, you’ll need more freezer space than you can probably allocate in your refrigerator freezer, but the smallest chest freezer will be sufficient. To see some photos, check out our blog post titled How Big Is Half A Pig. Q: How long will pork last in the freezer before it goes bad? A: Over time, frozen meat gets subjected to “freezer burn”, which adversely affects the taste. Pork fat can go rancid and develop noticeable off flavors after six months. The general rule is, the sooner you eat pork, the better. The time partially depends on how well the meat is wrapped. The cuts can either be vacuum-sealed in a heavy plastic bag or wrapped in freezer paper. The vacuum bags are nice because you can see the meat through the bag, but it’s much easier to accidentally poke a hole in it vs freezer paper. If you want your meat to last the longest, freezer paper is the way to go. The freezer design also plays a role. “Frost-free” freezers cause freezer burn faster than those that are not frost-free. Q: Do I have the option of getting my hog scalded and butchered with the skin on? A: Yes, Mt Angel Meat provides this service. Sometimes people want a whole hog for roasting with the hide on (and the hair removed) or prefer to leave the hide on for charcuterie. Scalding removes the hair and cleans the skin, but it also increases the hanging weight, which in turn, increases your cost. Q: Are the pigs raised on non-GMO feed? A: Yes, Elkhorn feeds a locally grown, locally milled non-GMO ration that made up of non-GMO peas and wheat. While our pasture is not “certified organic”, it has not had any herbicides or pesticides applied in over five years (some as long as 12 years). Q: Some pigs are fed “medicated” feed. Does Elkhorn use that? A: No, we don’t. Some farmers provide their young pigs with a feed that contains antibiotics as a preventive measure, but we don’t. No added growth hormones or antibiotics here. Q: Do your pigs have names? 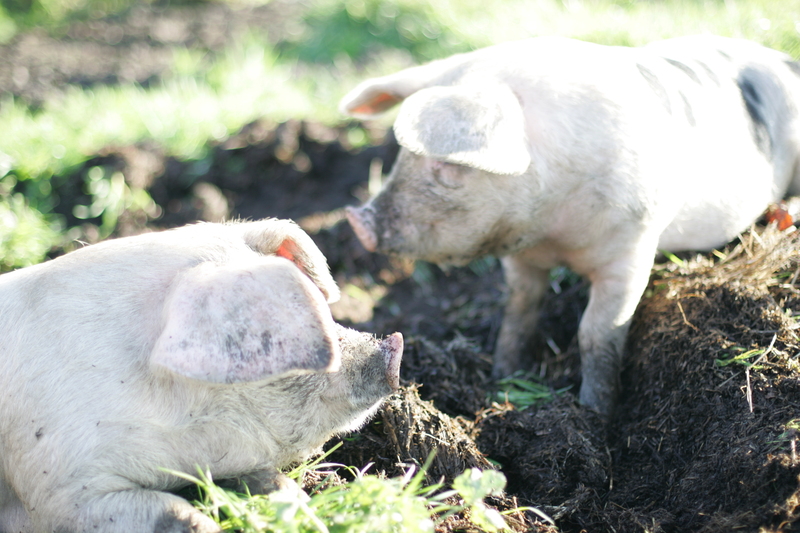 A: At the risk of sounding like we belong on Portlandia, yes, we do name some of our pigs when a name presents itself. Q: Isn’t it difficult to slaughter pigs if they have names? Do you get attached to them? A: Yes, we get attached to our pigs. We know them individually and we’re sad when it’s time for them to go. We see that as a good thing. We care deeply about the welfare of our pigs and it’s what drives us to provide our pigs with the very best life possible. Q: How often do you have pork available for sale? A: We have pork available every month. To see what’s currently available, please visit our online store. If you don’t see what you want, send us a note and we’ll work it out.